Are Contingent Attorneys' Fees Tax Deductible? If you agree to a contingent-fee arrangement with your attorney, you may wonder whether the expense is deductible for federal income tax purposes. Unfortunately, the guidance on this controversial issue isn't favorable to taxpayers in most situations. The main article focuses on contingent fees related to taxable judgments or settlements collected by individual claimants in cases that aren't business-related. Here's an overview of the rules that apply to contingent fees for other types of recoveries. An injured party can't deduct attorneys' fees incurred to collect a tax-free judgment or settlement, including a court-awarded recovery for a physical injury or sickness. In other words, no deductions are allowed for fees to collect tax-free compensation. In cases involving business-related judgments or settlements, taxpayers are allowed to deduct all ordinary and necessary expenses incurred in carrying on an active business. Legal expenses constitute such ordinary and necessary expenses when they arise from an active business venture. In general, attorneys' fees that aren't contingent on the outcome of a case are treated in the same fashion as contingent fees. For example, non-contingent fees paid to collect a taxable non-business judgment or settlement would be treated as miscellaneous itemized deductions unless the above-the-line exception applies. (See main article.) And non-contingent fees paid to collect a tax-free judgment or settlement wouldn't be deductible. The federal income tax treatment of contingent fees paid to an attorney out of a taxable non-business judgment or settlement has been a source of confusion. Here's an overview of the outcome of litigation between individual taxpayers and the IRS, along with a taxpayer-friendly exception to the general rule. 2. Treat the related contingent attorneys' fee as a miscellaneous itemized deduction. Taxpayers don't generally favor this treatment, because miscellaneous itemized deductions are subject to a 2%-of-adjusted-gross-income threshold under the regular federal income tax rules. Additional miscellaneous itemized deductions are completely disallowed under the alternative minimum tax (AMT) rules. So, the actual allowable write-off for contingent fees is significantly reduced or maybe even completely disallowed if the taxpayer is subject to AMT. Instead, taxpayers favor other court decisions that exclude contingent fees from the claimant's gross income, because the fees are considered "owned" by the attorney rather than the claimant. This reasoning is consistent with the fact that the claimant never takes possession of the cash; rather, contingent fees go straight to the attorney. The decision was based on the Supreme Court's review of Banks (a Sixth Circuit Court of Appeals decision) and Banaitis (a Ninth Circuit Court of Appeal decision). In both of those decisions, the appellate courts had reversed the U.S. Tax Court, concluding that the taxpayers could exclude from gross income amounts paid to their attorneys under contingent-fee arrangements. The Supreme Court disagreed with these reversals, however. The Court ruled that, even though the value of taxpayers' legal claims are speculative at the time they enter into a contingent-fee arrangement with an attorney, that factor doesn't cause the arrangement to be properly characterized for tax purposes as a partnership or joint venture between taxpayer and attorney. The Court concluded that the attorney-client relationship is more properly characterized as a principal-agent relationship. As such, the taxpayer (the principal) must include the entire taxable amount earned from the legal action in gross income and then hope to be able to claim a deduction for contingent fees paid to the attorney (the agent). In essence, the Supreme Court's decision reaffirmed one of the oldest principles in federal income taxation: A taxpayer can't assign taxable income to someone else, even though the attempt to do so may occur before the income is actually earned. Instead, taxpayers must include the income on their return when it's earned, and then hope to be able to deduct amounts that go to other parties (such as contingent fees paid to attorneys). The Supreme Court's decision seems to close the door on any argument that contingent attorneys' fees paid out of a taxable non-business judgment or settlement can be excluded from a claimant's gross income. But Congress provided an exception that basically amounts to the same thing for certain taxpayers. Private causes of action under the Medicare Secondary Payer statute. Important note: Above-the-line deduction treatment for qualifying contingent legal fees and related costs effectively allows you to directly subtract these expenses from the amount of the judgment or settlement that you claim. So, you pay taxes on only the amount you keep. 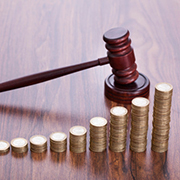 Determining the proper tax treatment of an individual's attorneys' fees can be tricky. Your tax advisor can figure out the right answer. Get your advisor involved early in litigation, because he or she might be able to help you achieve a more tax-favorable result by planning ahead.